Daily newspapers still serve as a primary window into the world around you. It’s probably not fair to call them just newspapers anymore, especially since you can access their stories in so many different ways – including your desktop and your phone. Branding campaigns are nothing new for newspapers – or any news organization for that matter. They’re as common (though not nearly as long-lasting) as their taglines. I’ll probably find some way to dig up the money to pay for a monthly online subscription to The New York Times once the pay wall goes up because to me it’s still the place for “All The News That’s Fit to Print.” It’s also currently “where the conversation begins,” and for many, that’s exactly the case. I still occasionally watch the long version of the 1998 in-house piece celebrating the oldest television station in the country , remembering that while the years may go by, there is always one constant. It’s a constant at least for those of us who’ve never known life without a television. The Boston Globe decided a couple of years ago in the midst of rumors declaring their demise that they would remind folks that they were telling one “really good” story while highlighting what made them different and celebrating their primary focus – the people, places and things that make Boston unique. Some area bloggers felt compelled to help save the paper, recognizing its importance. 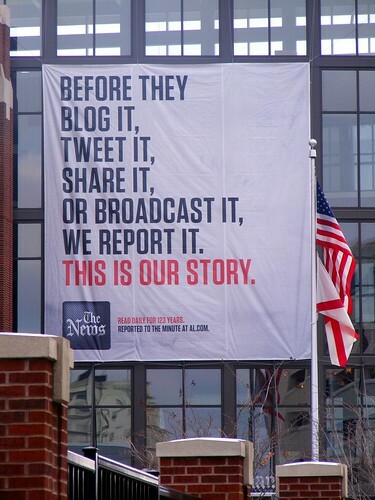 Our daily paper Birmingham, AL, The Birmingham News, recently launched a new branding campaign titled, “This Is Our Story.” The image up above is what those who drive past their physical headquarters downtown see every day. It seems to be meant to remind everyone that they are the newspaper of record. It probably comes across a lot more confrontational than they intended. It is a true statement though, especially if you look at their online product. A scan of The Birmingham News‘ twitter stream shows the only profiles retweeted are those of its sister publications in the state. This is compared to the stream for the Twitter account The Boston Globe maintains. While I was working on this post, they responded directly someone who made a suggestion about a story. Then there’s one of the accounts maintained by Boston.com, which includes retweets of community news site Universal Hub and stories shared by their reporters via their personal online accounts. An example closer to home is the stream maintained by AL.com, which while not nearly as much as it once did, does engage with its virtual audience. The story doesn’t end when the paper leaves the production facility. The city’s story is written every day while the individual stories in the paper continue to evolve as more and more is discovered and shared. It is in fact our story (one that all of us can claim), but for it to truly be viewed that way, it needs to be approached as a collaborative, embracing effort instead of one that looks like it isn’t. A preliminary report completed for The Chicago Community Trust as part of a recent community news summit demonstrated that perhaps that network is a little more inclusive than legacy media tends to realize at times. Legacy media’s spot in the pecking order of importance for daily sources of news is secure, especially if the organization in question is still serving its primary purpose. The bigger issue is figuring out just how to make it “our” story and not just their reporting. Maybe the issue shouldn’t be one of reminding people you’re here, but offering chances to add to the story. There are initiatives like the one that’s about to take place in Boston next month is a logical step in that process. Boston.com will be inviting individuals in for a one day hack challenge with the goal of producing tools that will help make the lives of those online citizens better. A recent edition of #wjchat also looks at ways that people can become part of the process while still allowing the paper to serve its role as informer-in-chief. What do you think? What other examples are out there – good, bad, neutral? Thanks for the look at this really interesting approach. When a lot of news organizations are thinking about collaboration and conversation, this does feel like a territory-staking move. They peed on the tree first. What about the community? Is it also THEIR story? The News needs to spend more time engaging with the community – including the horrible “they” who blog, tweet and share – and less time telling us why they’re not dying. More time reporting on actual stories, less time worrying about offending advertisers. Thanks for the comment! Luckily there are a few reporters doing a great job talking with readers online as they do offline. It would just be nicer if the official account did so as well.